Bite into a lentil samosa and let warm spices of India chase away winter’s chill. Tomato and onion chutney provides a rich companion sauce with a hint of natural sweetness. As a holiday starter, game day appetizer, or enticing buffet option, gluten free samosas offer flavour, protein, and crunch. While I still love the bold flavours of Tex-Mex this time of year, Indian samosas are a refreshing change of pace. Especially when they are seasoned with one of my favourite spice combinations–ginger and cumin. The enchantingly simple rice wrapper packages the lentil and veggie filling with ease. It avoids both wheat flour and the hassle of preparing dough. After success with rice wrappers for Gluten-Free Pigs in a Blanket, I suspected they would work well for samosas. And they did, though in this case I prefer to fry the samosas to get a crispier covering. But baking also works, and it’s a simpler option. Here’s what the non-fried samosas look like after baking: One word of caution though. The samosas are too hot to eat right away, especially after baking. They will firm up and be easier to eat as they cool down. Try not to bite into them too soon! Wait at least 5 to 10 minutes, and your patience will be deliciously rewarded. These samosas also freeze and reheat beautifully in the oven. I made a big batch of samosas and wrapped them up individually in plastic wrap so they wouldn’t stick together. Then I popped them in a zip top bag; convenient homemade samosas were awaiting me whenever I needed them. I needed some today. They were just as delicious inside as the day I made them, and even crunchier on the outside. It’s a perfect recipe for this time of year because you can make, freeze, and easily enjoy samosas whenever you need an option that’s quick and easy. Heat 1.5 cups water to boiling and add lentils. Reduce heat to simmer for about 20 minutes, until lentils soften. Drain excess water. Stir in sea salt to taste, then chili powder, ginger, and turmeric. Add a tablespoon of cooking oil to a skillet and saute onions, carrots, and cauliflower until tender. Add ground cumin and cook for one more minute. Combine vegetable mixture with lentils. Add cooked ground chicken if using. Let filling cool for a few minutes. Add about 1 cm of very warm water to a dinner plate. Dip one rice wrapper in the water until it is completely moistened on both sides. Carefully move the softened rice wrapper to a flat work surface and place filling in the center of the wrapper (click on the slide tutorial below). 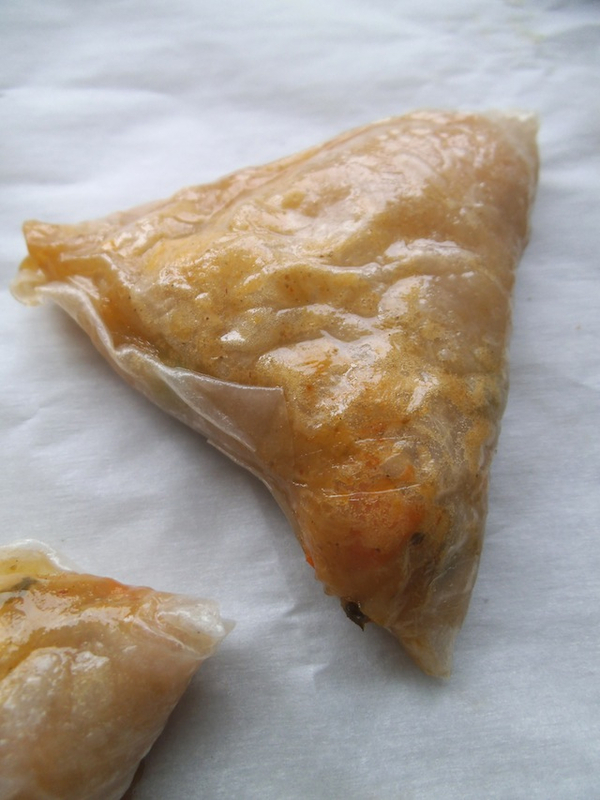 Wrap the filling to form a triangular samosa. Continue making samosas until filling is gone. To fry samosas, heat 2 cm oil in a wok or skillet over medium heat. Carefully place as many samosas as will fit without touching each other. Fry for 1 to 2 minutes on each side, until crispy. 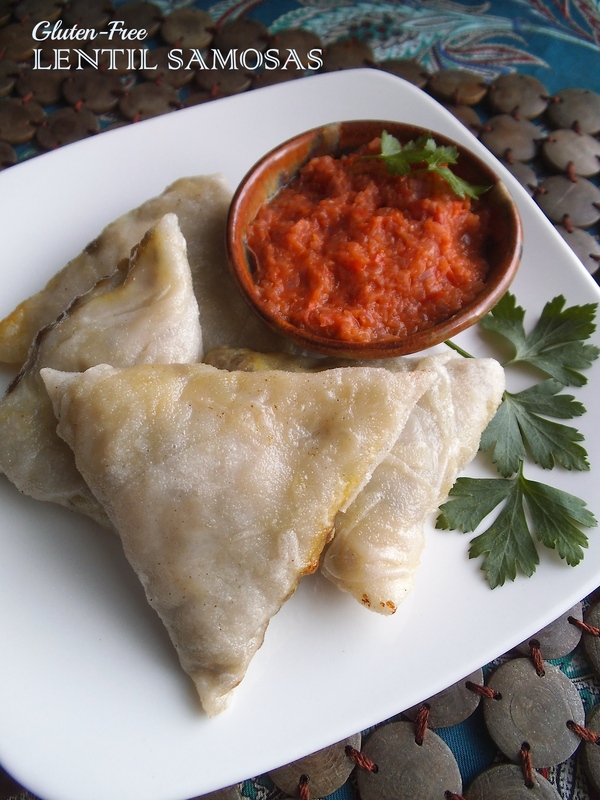 To bake instead of fry, baste each samosa with oil. Preheat oven to 375 degrees F (190C). Place samosas onto a baking sheet lined with parchment and bake for about 15 minutes, until wrappers are slightly crisp. 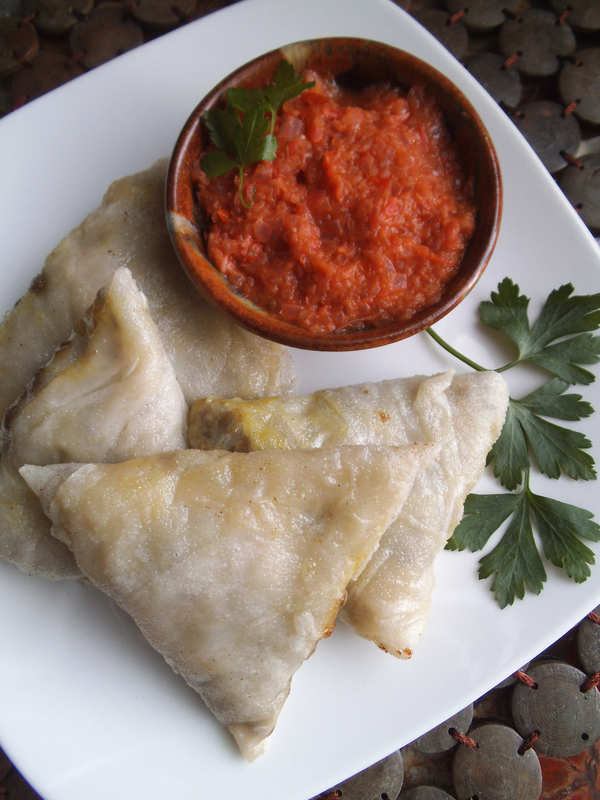 Serve samosas warm, with chutney sauce on the side (see chutney recipe below). *If adding ground chicken, brown it in an oiled skillet, add salt and curry powder or curry paste to taste, and continue cooking until cooked through. Stir into cooked lentils. ** The fried samosas freeze well! Wrap them individually before putting them in a freezer bag or sealed container. Unwrap and reheat in the oven at 375 degrees (190 C) for about 10 minutes. Let cool for a few minutes before serving. Over medium heat, heat oil in a medium to large skillet or wok. Add onion and saute for 5 minutes, stirring frequently. Add garlic, and cook for another minute. Add tomatoes and cook them until they are soft, about 7 to 10 minutes. Season with spices and salt, stirring to mix well. Turn off heat and transfer the tomato and onion mixture to a heat-proof bowl. Let cool for 5 to 10 minutes before pouring everything into a food processor. Pulse the chutney until the desired smooth or chunky texture is reached. Spoon into a serving bowl to accompany the samosas. Or serve as a spread for naan bread. I’m sharing this at Allergy Free Wednesdays, Gluten Free Wednesdays, Savoring Saturdays, and here. This looks delicious! I’ve always wanted to try samosas at home as it’s one of my favourite sides. I’m feeling inspired now! Thanks! I hope you do try the samosas. They are so good that I keep making more! They would be great to make for a dinner party! Looks delicious! Yes, they would be a great dish for company! Enjoy! Thanks! I need to make more and invite someone over to share. These look absolutely delicious! I love love lentils, I bet they make a really wonderful filling here. I’d never think to use rice papers for samosas, smart idea! Yum! I love samosas but my son can’t eat wheat so I’ve been avoiding. But this looks like the perfect way to make them. Pinning! My partner has celiac disease and really misses being able to have samosas. I’m going to have to try this one!